Article and photos, unless otherwise noted, by Eric Hurwitz. Article updated on 11/02/17. 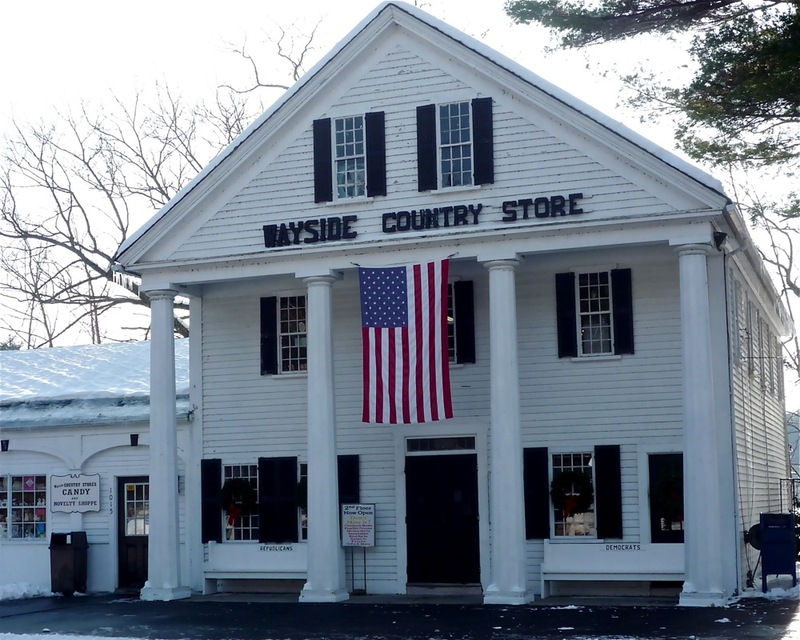 I love a classic New England country store -- the quaint old-fashioned feeling, the chance to shop for hard-to-find items, the aromas of candles and soaps, the proverbial pickle barrel, peanut butter-making machine, and the delicious offerings of local cheeses, fudge and maple syrup. 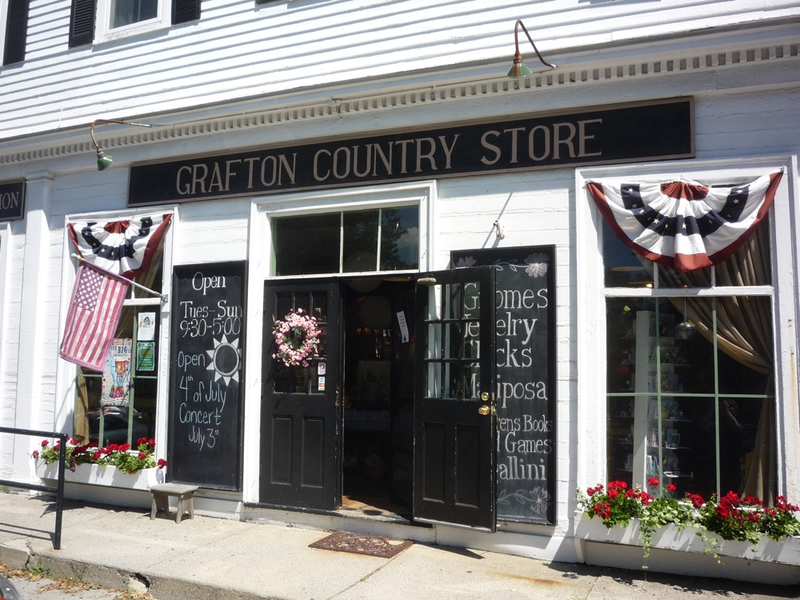 Plus, as a bonus, these country stores are usually located in quaint, charming New England towns and villages worth visiting! 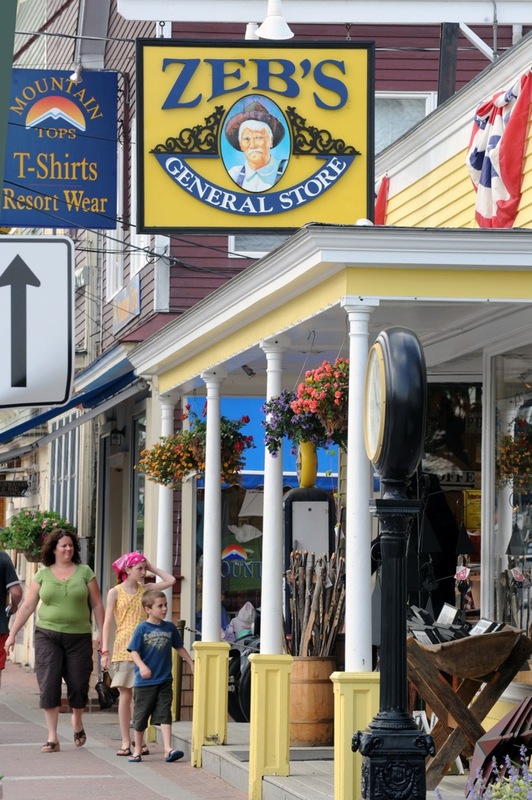 Also known as general stores, these retro places offer a genuine way to experience the local flavor of traditional New England. 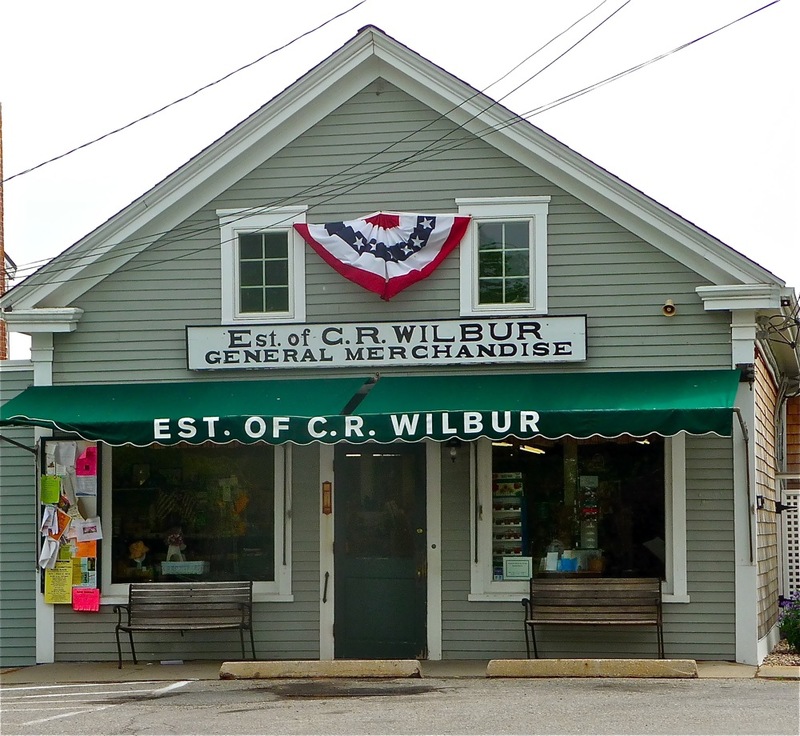 Dating back to Colonial times as centers of local commerce by selling a broad line of merchandise to meet the needs of rural townsfolk, many country stores, thankfully, still exist and thrive in New England. While country stores in Vermont tend to receive the most fanfare -- and rightfully so, given their authentic magnificence -- the other five New England states also offer wholesome, nostalgic shopping experiences just as memorable and rewarding. We cover them in this article. 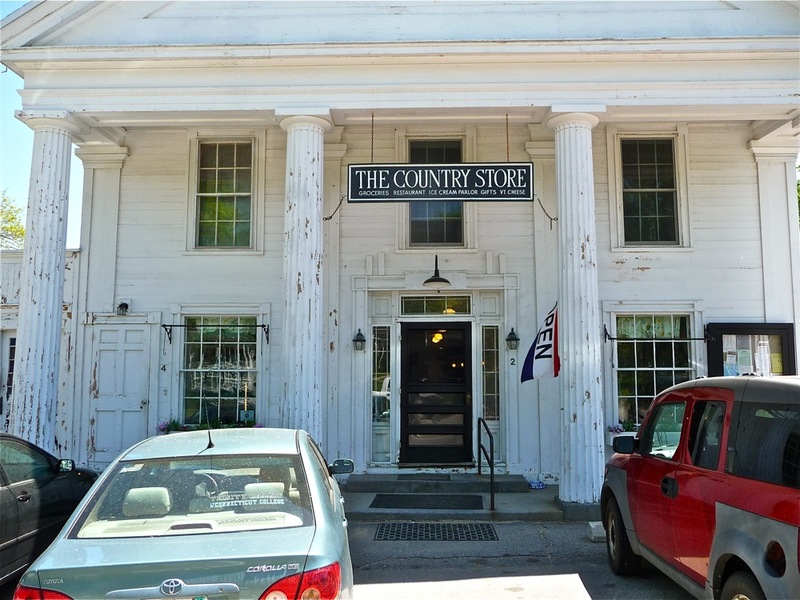 Not all country stores are created equally, however; each one is as unique as New England itself. Some stores modestly offer just enough to service the local public while others are outright tourist attractions selling everything but the kitchen sink. But all have great New England charm in one way or another, and a tremendous appeal to those of us who like a nostalgic vibe and feeling that evokes simpler times..
Vermont Country Store, Weston, Vt.
Old Country Store and Emporium, West Mansfield, Mass. Zeb's General Store, North Conway, N.H.
Zeb's General Store. Photo source: Zeb's General Store. Wayside Country Store, Marlborough, Mass. Brown and Hopkins, Chepachet, R.I.
Brown and Hopkins Country Store. Putney General Store, Putney, Vt.
Marshfield Hills General Store, Marshfield, Mass. Shaw's General Store, Stowe, Vt.
No matter how much Stowe commercially develops, it will always remain a small town at heart. 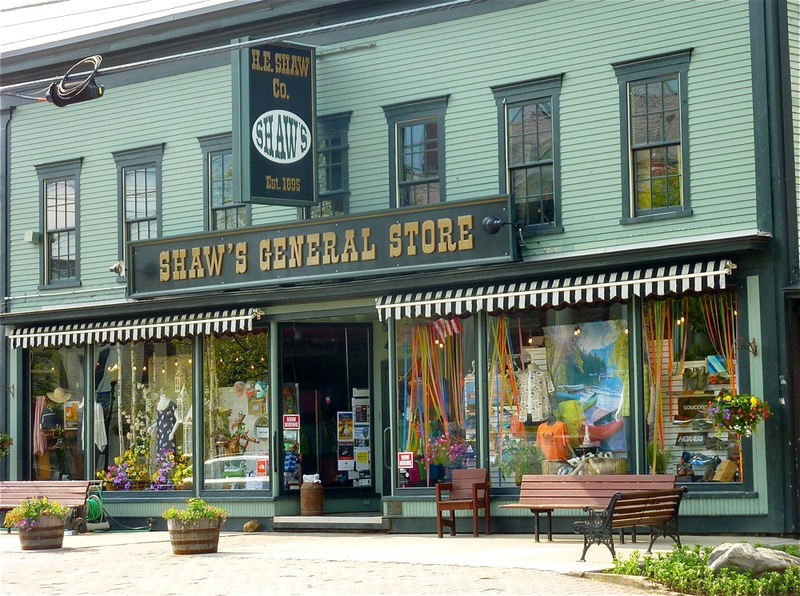 Shaw's General Store, located in the heart of the quaint downtown, greatly helps Stowe remain that quaint town that locals and visitors have come to love by serving as the cornerstone business of Stowe Village since 1895. The historic wooden building, old-fashioned sign, benches out front and window displays saturated without an inch to spare epitomize, at first glance, the classic Maine Street local business that seem to be increasingly rare in the United States. 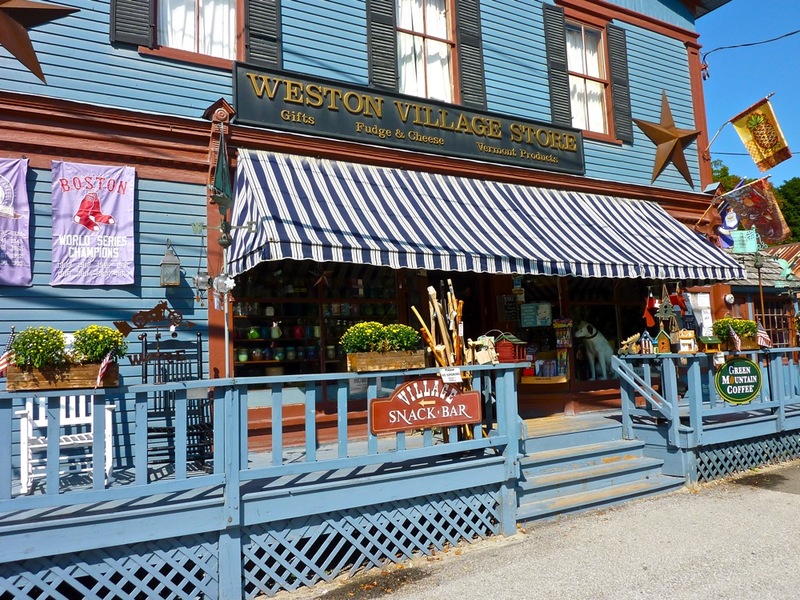 The delightful mix of outdoor clothing, footwear, toys and games, t-shirts, sweatshirts, caps, maple products, Vermont cheese, and souvenirs create this wonderful trip back in time experience that, at the same time, still remains relevant with some high quality merchandise. The locals speak fondly of its Stowe Village cornerstone business, while visitors appreciate Shaw's uncanny knack of offering what they need. 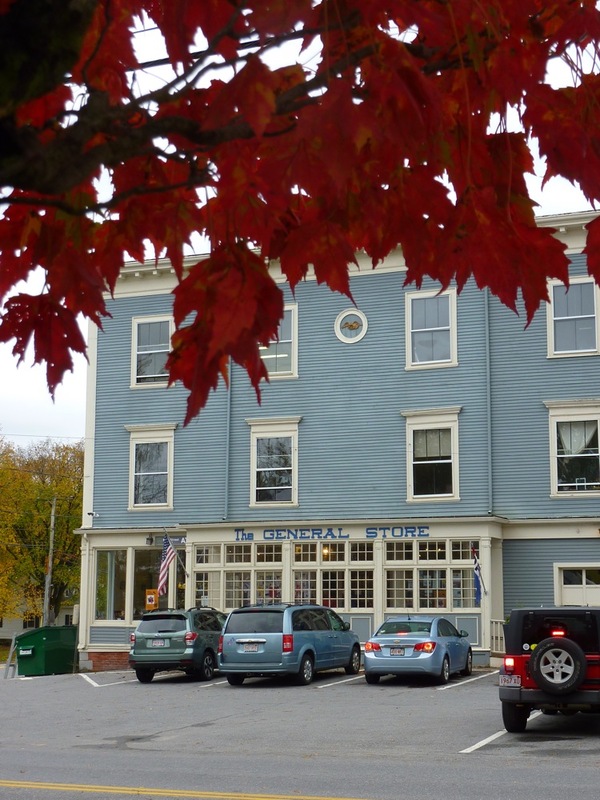 While there's no doubt that Shaw's General Store has evolved into much more than a simple general store from the past, it reflects Stowe's growth -- that is, if Stowe will always remain a small town at heart no matter how much growth, then Shaw's will always remain a pure general store at heart. Its dedication to servicing a community and its vacationers, the friendly employees, and old-time feel lend an undeniable authenticity to the store. 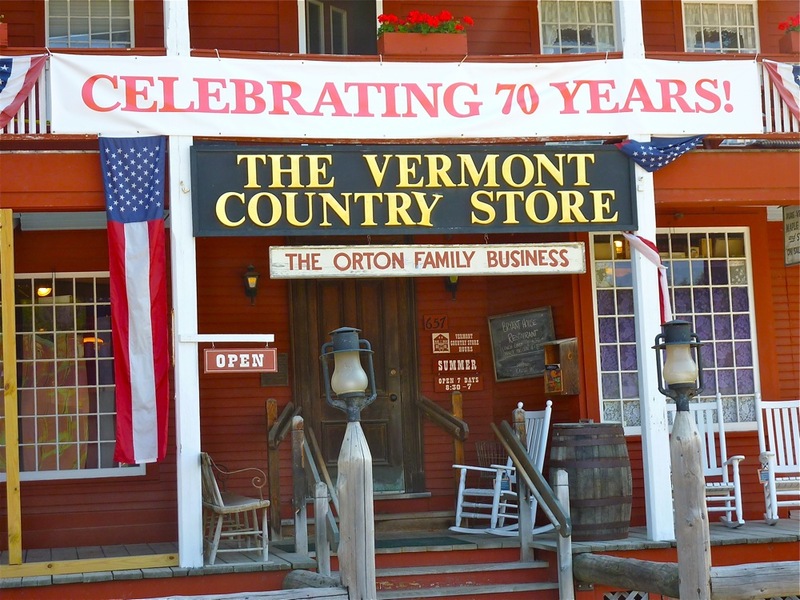 There's something to be said about a country store in Vermont dating back to 1895 that continues to be the "household name" local business, to this very day. Shaw's General Store, 54 Main St., Stowe, Vt. Tel. 802-253-4040. 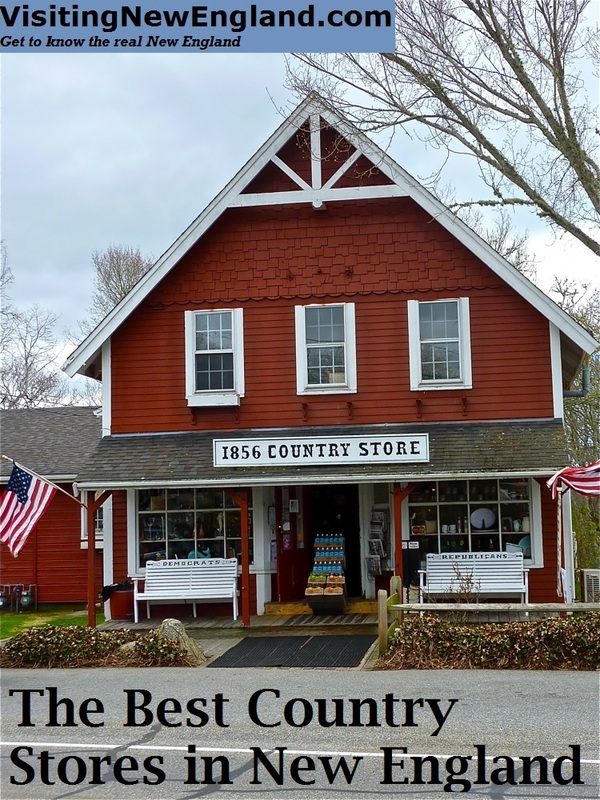 The 1856 Country Store actually started in 1840 as a place to store cranberries after the harvest. After that, it became a shoe store until 1856 when changing retail formats to a general store. Imagine that, a small town business that has survived every trend, every competing retail monopoly and every bad economy through the years? The 1856 Country Store has come out of those societal assaults quite well as a welcoming respite from a fast-paced world -- although it must be said that downtown Centerville has remained true to form with a peaceful aura, beautiful old homes and a classic, quaint New England small town vibe. 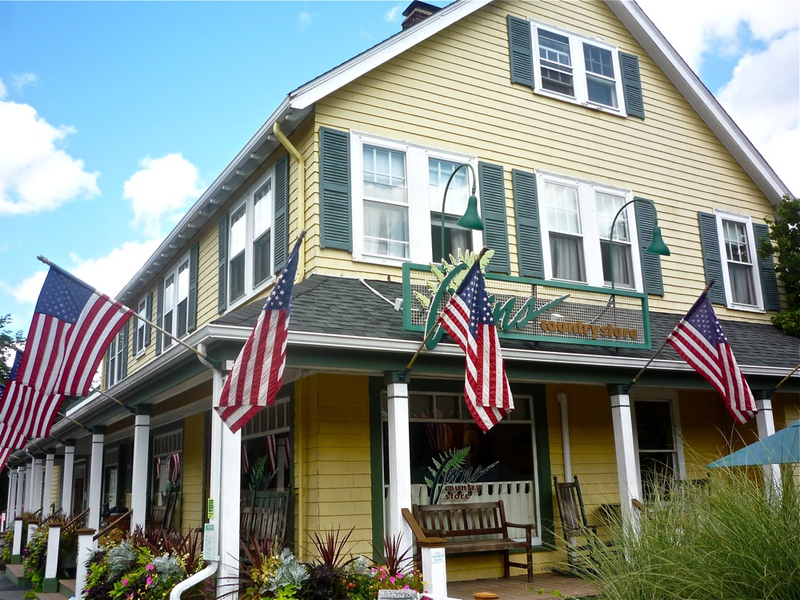 Located just minutes from Craigville Beach and virtually around the corner from the famous, must-visit Four Seas Ice Cream Stand, the 1856 Country Store, with its wooden red exterior and an American flag out front, has that "happy place" feel with its welcoming staff and old-fashioned goods. 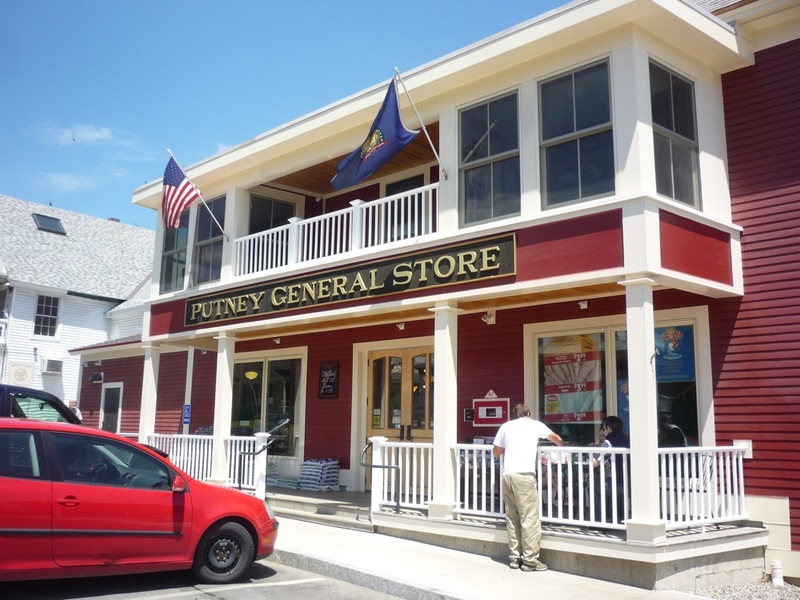 All the tenets of a great country store can be seen here including penny candy, beach balls, old-fashioned toys, greeting cards, candles, handmade soaps and jams and jellies, as well as Cape Cod souvenirs that serve as reminders of summer vacation time. It is also a place for home accent and decor merchandise. Not the largest country store, the 1856 Country Store more than makes up from its lack of size with a fabulous selection of merchandise jam-packed to the gills and a demeanor that takes us back to a gentler time. Perhaps the most genuine description of the 1856 Country Store resides on its two outside benches -- one that states, "DEMOCRATS," and the other "REPUBLICANS." In a country that has become so divided and prone to favoring identity politics over good, old-fashioned neighborly relations, how refreshing it is to see a place that loves and welcomes all people! 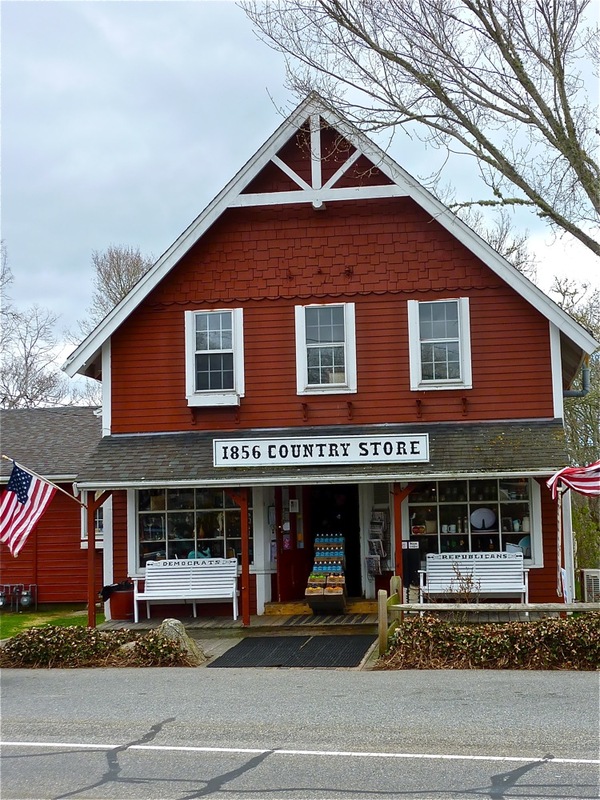 1856 Country Store, 555 Main St., Centerville, Mass. Tel. 508-775-1856. Williamsburg General Store, Williamsburg, Mass. 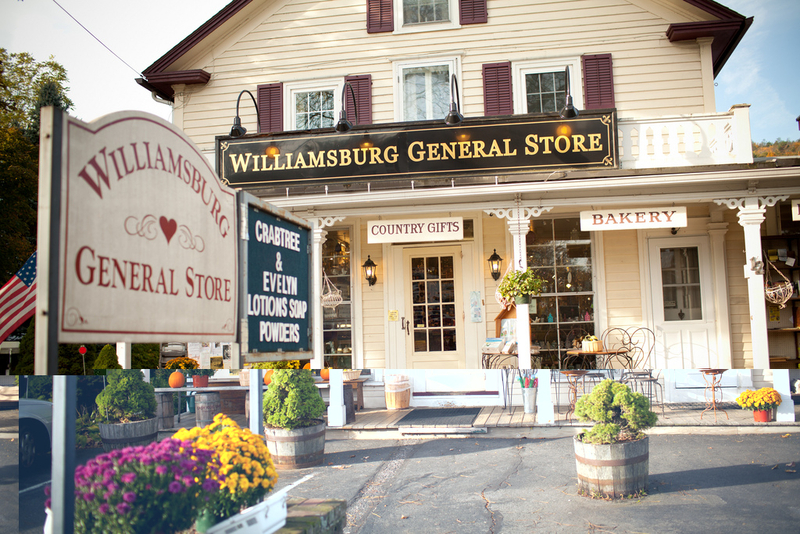 Williamsburg General Store. Photo source: Massachusetts Office of Travel and Tourism Flickr page. F.H. 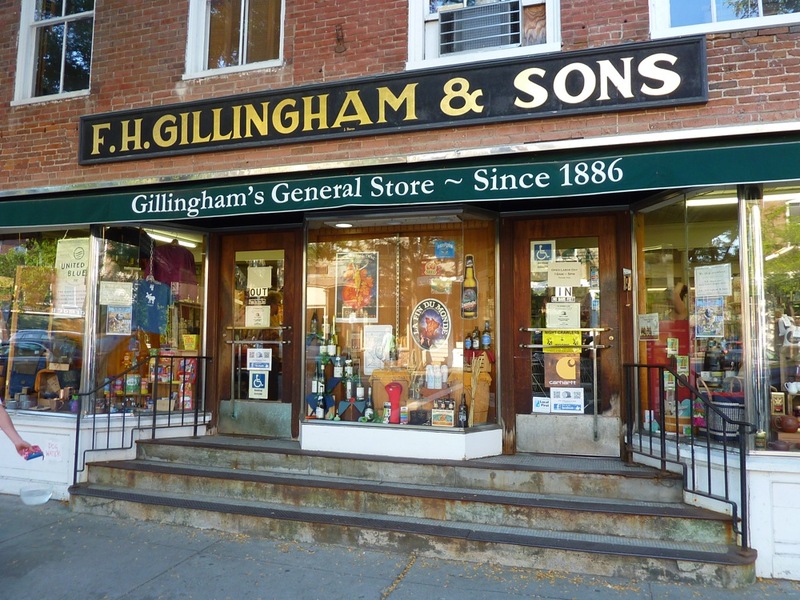 Gillingham and Sons, Inc., Country Store, Woodstock , Vt. The Country Store in Petersham, Mass. The Country Store in Petersham. Wilbur General Store, Little Compton, R.I.
Weston Village Store, Weston, Vt.
Grafton Country Store, Grafton, Mass. Calef's Country Store, Barrington, N.H.
Calef's Country Store. Photo source: Calef's Country Store Facebook fan page at https://www.facebook.com/CalefsCountryStore/. Fiske's General Store, Holliston, Mass. Fiske's General Store is an ideal place for families with its mix of toys, board games, puzzles, candies, party goods, helium balloons, craft kits, household items and artist supplies. It's really not the type of general store that tourists travel distances to, but more of a beloved local store. With that said, I would rather shop here than the big box stores as everything here just seems so real and down-to-earth. Any traveler near Holliston should definitely stop here to get a true retro sense of a surviving, old-time general store. The owners really care about their community, the people and their store, and don't give in to modern merchandising trends. You won't see a lot of electronics at Fiske's and the times I have been here, one of the most unusual phenomenons has occurred: Very few people are tethered to their cell phones! They are actually talking with each other, and the owners who don't mind long conversations at all. I know, strange it seems, but so refreshing in this often impersonal world. Somehow I get the feeling James F. Fiske -- who founded the store in 1863 -- would be smiling with pride at the way the 21st century version of Fiske's has carried on a grand, local retail tradition. 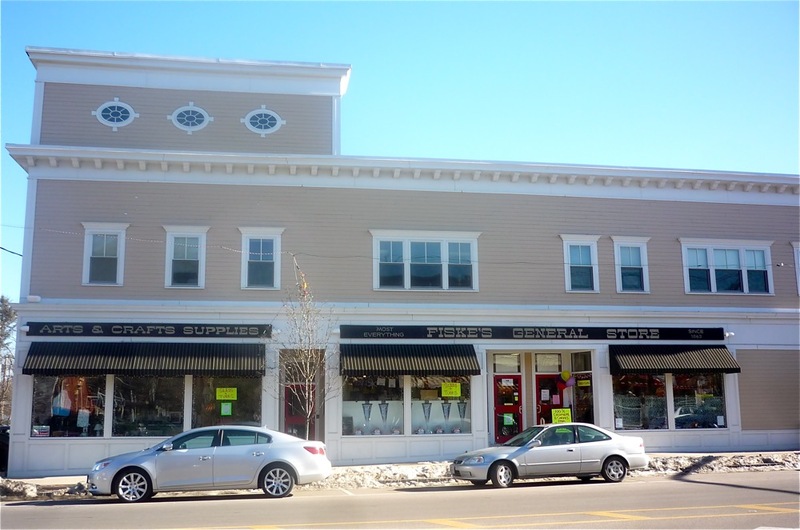 Added bonus: Fiske's General Store is located across the street from another old school treasure, the Holliston Suprette. It's one of the last neighborhood grocery stores in the Boston area (first opening in 1960)! Fiske's General Store, 776 Washington St., Holliston, Mass. Tel. 508-429-4041. Web site: http://www.fiskesgeneralstore.com. Harvard General Store, Harvard, Mass. After school, the Harvard General Store looks like something out of a 1940s movie with student's book bags stacked up in the foyer and kids doing homework over cookies and other baked goods at one of the dining area tables. The rest of the time, this classic general store brings in people of all ages to enjoy a wide variety of services for the community and travelers in this idyllic north central Massachusetts town. Revived several years back by owner Scott Hayward, the Harvard General Store is not only a place to buy groceries, prepared foods and convenience items, but also wine and beer, gifts and great produce at its Saturday farmers market (always call ahead for seasonal dates and times). The Harvard General Store even holds wine tasting events! The old-time general store ambiance of the cafe provides a perfect, traditional dining out setting for breakfasts, sandwiches, wraps, soups, salads, quiche, vegetarian dishes, variety of coffee and related specialty drinks, hot chocolate, teas and baked goods. There's a bike sales and repair shop in the General Store, and a 2,500 sq foot public venue facility called Upstairs @ The General that is often used for entertainment, receptions, fund raisers, rehearsal dinners, showers, birthday parties, corporate holiday parties and seminars and luncheons. 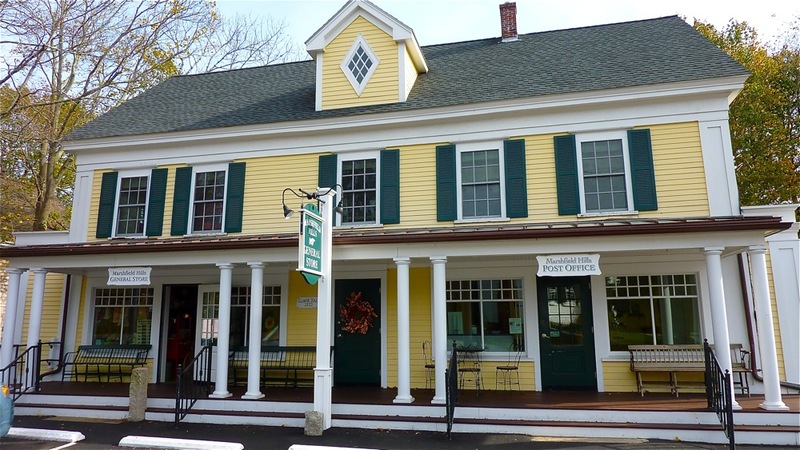 Located across the street from the scenic Harvard town common, the building has been around since the early 1800s with many tenants and types of businesses occupying the site. The current Harvard General Store, however, looks like a business in it for the long run with its outstanding variety of goods and services, a strong customer base, and a clear mission to follow the critical tenets that have made so many general stores in New England successful. Just a few years in business, the Harvard General Store already ranks among the very best of general stores in New England. Harvard General Store, 1 Still River Rd., Harvard, Mass. Tel. 978-430-0062. Web site: http://www.harvardgeneralstore.com. Ferns Country Store, Carlisle, Mass. 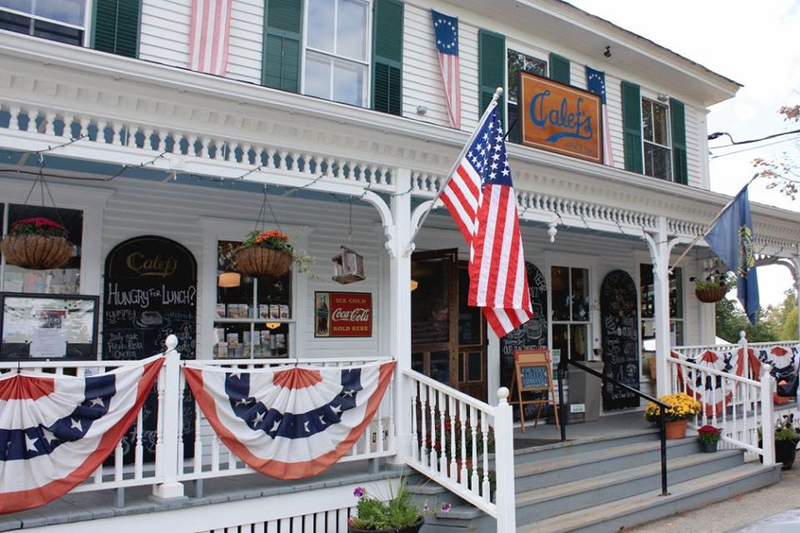 Ferns Country Store is a perfect fit for Carlisle, an upscale semi-rural community with old New England charm in its homes, farms, churches and winding, scenic country roads. I would imagine drivers and bicyclists not familiar with Carlisle discovering Ferns for the first time and feeling so good to see a welcoming, beautiful country store to stop for a while. Ferns serves a valuable purpose for those locals and out-of-towners as a place to buy groceries, beer and wine, baked goods, deli items, soups and pizza. The indoor and outdoor Smiling Duck Cafe -- "THE social place to meet in Carisle," as stated on Ferns web site -- is a cozy and a wonderful place for some breakfast, lunch or dinner (Ferns makes an incredible homemade chili, by the way). The outdoor dining area has attractive surrounding gardens and a waterfall! Ferns also has a nice selection of gifts, including items made in Carlisle. Some of the merchandise offered: hats, shirts, handbags, drinking glasses and mugs, and shirts. The building -- which has housed general stores since 1844 -- didn't always look great, but newest owners Larry Bearfield and Robin Emerson had the store beautifully restored starting around 2003. Ferns now looks like the winner of a country store beauty contest with yellow paint coating the exterior, green shutters, draping American flags, a wraparound front porch with benches and rocking chairs, a spiffy new sign that looks old, neat-as-a-pin landscaping and a refreshed, attractive country store interior. Now, Ferns is the centerpiece and anchor of a quiet downtown that looks "New England" as any small town you'd see in Vermont and New Hampshire. Nice that it is only 40 minutes or so from Boston! Ferns Country Store, 8 Lowell St. Tel. 978 369-0200. web site: http://www.fernscountrystore.com. Please share the graphics below on Pinterest. Thanks!